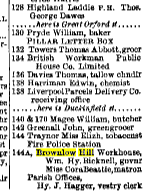 I am researching my family history, and have discovered that one of my family members was born at 144a Brownlow Hill in Liverpool. This was not the family address at that time, and the father was listed as living at the family address. Was this place a maternity hospital? or perhaps some other form of institution? The birth was completely Legitimate, The couple having married the previous year.